This is the year of the tablets, or at least the start of what may become the norm in personal computing (just go back and watch all those old sci-fi moviesor Avatar, and you’ll understand). Dell is beefing up their tablet offering by adding as many carriers as possible to their tablet line. 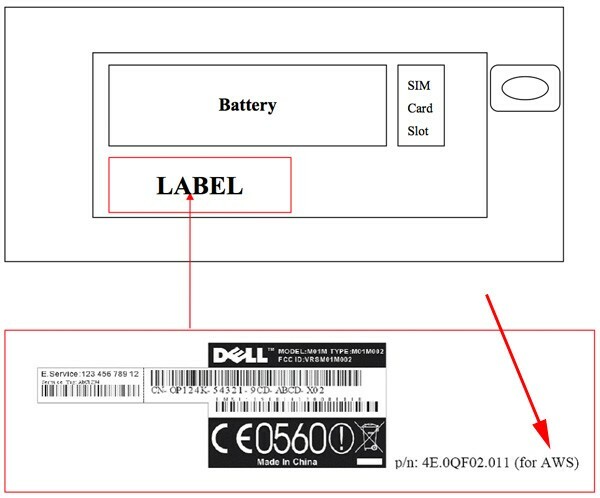 Their Dell Mini 5, with Android, just passed the FCC with WCDMA Band IV, or AWS (just look at that arrow up there). This means that the tablet will work on T-Mobile’s 3G network, though it may not be subsidized. A quick look at specs include something newer than Android 1.6, five-inch 800 x 480 capacitive touchscreen, Snapdragon QSD8250 chipset (1GHz! ), Bluetooth, WiFi, 3.5 mm headphone jack, 5 MP camera and GPS. Leave your thoughts in the comments! I don’t call this tablet since it use Android not a full OS like windows 7. If I want to buy tablet I buy HP Slate with Windows 7 on it. If I want to buy phone with big screen I buy HTC HD2. If I want to buy huge phone then maybe buy this Dell Mini5. It has nice deisgn for sure but kind of useless as a tablet or slate. That’s an enviable dilemma eh? Will this tablet be able to take advantage of TMO’s HSPA+ service? how will dell sell this? will they google way or will i have to upgrade my data plan. would rather pay 500 and be able to use my tzones. Ok this is great news for me! I got the HD2 when it came out and hated it and picked up a Nexus one which is great, but I think the mini 5 will be nicer with the big screen. Can’t wait till this is out!!! I have been waiting on this for some time now. I will add this to my collection and carry it along with my hd2, why you ask because I don’t think using this a phone would be silly unless I use a bluetooth headset. but to have it as my web browser and everything else would be nice. maybe I am wrong but having both the mini and the hd will make for a serious one two punch. bye bye laptop and extra frap to carry when traveling. Smith, Android is an OS and is being ported to some netbooks and can probably run on computers. It has the potential to be every bit as good if not better than Windows. If Michael Dell himself hand delivered this or any other of his crappy products, I would not only shut the door in his face, but I would also let my dog at him. Dell products to me is nothing more than Hell products. What if M. Dell is a dog person, feeds your snarly mutt a handful of beef tips and gets his tail all a-waggin? Not my cup of tea. 5″ screen is too big for a phone but too small for a tablet. What are they trying to achieve? I don’t mind a 5 inch phone/tablet, however the design would have to be like HD2-like in the sense that there’s so much more screen than phone. Based on the design this looks more like a Tablet type device, but hey you never know. I’m game. I been waiting on this device for a while already so bring it on. If they have separate devices for AWS and 850/1900 then they are still under the heels of the carriers. If you buy a carrier hobbled device without subsidy then you are locking yourself in to a carrier with no compensation for yourself. If a single device with all 4 bands (850/1700/1900/2100) is released it will mark the first time any OEM had the courage to allow competition between carriers for high speed service. Until then, the carriers are just working hard to make your cell phone bills higher than they need to be and OEMs are cowering in the corner, too afraid to deliver devices that allow for competition. Offering different ‘flavors’ may seem like a greater number of options, but in reality it’s fewer for the consumer in the end.